George Méliès, born in Paris in 1861, wasn’t encouraged to pursue the life of an artist. He was sent for a formal education, mandatory military service, and then to work as a clerk in London. When George decided he wanted to study painting his father refused to support him. George instead settled for work at the successful boot factory his mother and father had founded – a practical choice. George, however, did not forget his interest in stage magic which he had discovered while clerking in London. Three years later George bought the Théâtre Robert-Houdin with money from his wife’s dowry and funds from the sale of his share of the shoe business. Under his stewardship, adding new illusions, the Théâtre regained its popularity. 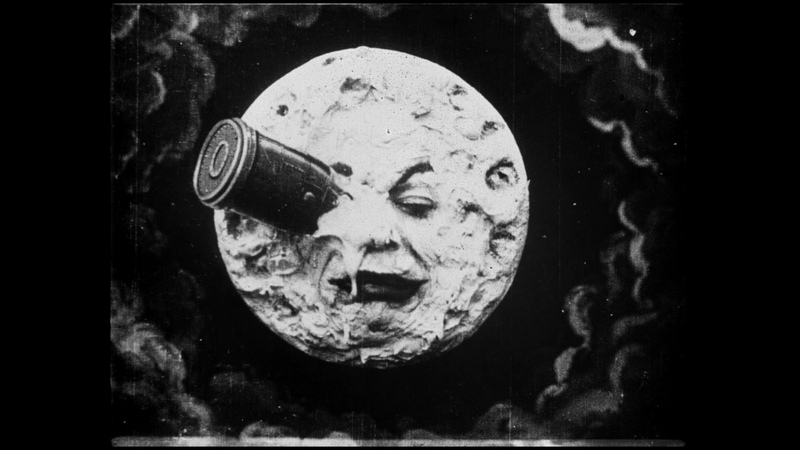 In 1895 Méliès was present at the first public screening of a Lumière brothers’ film in Paris and was captivated by film. By 1913 he had directed 513 films similar to his theatre’s illusions focusing more on special effects than plot, sometimes referred to as the first Cinemagician. He built a film studio and split his time between the studio and the theatre, working hours a labor of love makes possible. He earned international recognition, likely aided by the rampant piracy of his films, and opened a film office in New York. But unless we willingly make an exit at our pinnacle there will likely be a fall. His films fell out of favor in the popular culture and he was left unable to repay his debt to an investor. It was 1913 and the world was fighting its First World War. One of his studio buildings became a hospital for wounded soldiers. The French army melted down over 400 of his original films for the celluloid and silver. Méliès burned many of the rest along with sets and costumes. The great filmmaker became a toy salesman at the Montparnasse station in Paris. It was not until the 1920s when journalists renewed the public’s interest in his work that he was recognized for his contribution to film at a gala at the Salle Pleyel. He, along with his wife and granddaughter, were eventually admitted to live at La Maison du Retrait du Cinéma, where he could once again spend his time in the creative pursuits he had been drawn to since childhood. We should not expect fulfillment to bring us peace or be a journey with a definitive end. Fulfillment comes with risk which often demands a price. Though what price we would pay if we never pursued fulfillment at all – we’d most certainly never land on the moon.